A few weeks back I was in the far-flung southwest region of Utah’s West Desert taking photos for The Wilderness Society. They wanted a pictorial documentation of a rather unassuming line of mountains along the Nevada border called the Mountain Home Range. They are not the most picturesque of Basin and Range peaks, but really beauty can be found just about anywhere in nature, if one has a mind to look. One pinyon pine in particular was striking: not overly large, it made two 90 degree turns before ending in a tuft of bushy pine needles. Protruding from the top was one lone arm of a branch, reaching to the sky. This guy needed his photo taken. I set up my tripod first for a horizontal shot and bracketed several exposures. Nice, but I decided to focus more on the tree and the dramatic sky (snow was threatening). With the tripod low, I took several vertical exposures, merely trying to keep the thatch of pine needles separate from the hilly background. (As an FYI, I usually bracket with the idea that I may utilize exposure fusion or HDR, or some other methodology to expand the dynamic range of the final image.) I then finished with several hand-held vertical exposures with my infrared-converted DSLR. Once home I posted the horizontal and a B&W conversion of my favorite vertical HDR image (below) on Flickr. The B&W image in particular received a number of complimentary comments. 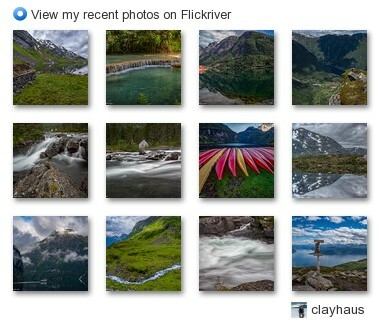 I then posted what I am calling the “Initial Version” on a Photo Critique forum a site called Photography Review. This is a great site where people actually take the time to review and critique your images in intelligent and thoughtful ways (unlike the usual “awesome shot, dude!” you get on Flickr). The main criticism of my images was that there was not enough separation between the tree trunk and the busy background. I didn’t disagree because as I shot the series of images at f/32, pretty much from the pebble in front of me to the distant peak a mile or so away was in focus. I do a lot of shooting in this mode: extremely long DOF (depth of field). I like it that way, usually. In this case, the background does compete a bit with the foreground (tree trunk), though it didn’t bother me that much. Nonetheless, using curves and local tonal/contrast adjustments, I attempted to separate the tree even more from the background and that yielded the “Mid Version.” The critiques were still not singing the praises, so in the “Final Version” I actually cloned-out some of the background details that were competing with the edges of the tree trunk. That version was to me, the most successful of the vertical shots (though I must admit being partial to the Infrared Version as well). Is the moral “You can’t please everyone.” No, though that is of course true. In the end it is not about pleasing anyone (though one should be pleased with one’s own images now and then). Rather, it should be about creating better compositions that work. Perhaps that tree would be much more of a successful image if I had shot it at f/5.6 instead. I should have thought of that and bracketed at that f-stop as well as at f/32. Will I make a trip back out to that particular spot to re-shoot? Unlikely. But, I guarantee you that I will think about this process the next time I have a foreground landscape object of interest against a potentially competing background. And though post-processing can work wonders, getting it as close to right as one can in the field, is the best plan.